Stan was a wonderful son, husband, father, farrier and friend. He had a great sense of humor and loved to laugh. He enjoyed all genres of music and depending on his mood you never knew what would be playing on the stereo; it could be Latino, country, pop, rap, jazz, or techno. His love for music started at a young age as his mother gave piano lessons in their home (she was an avid player of the accordion). Stan chose percussion and his passion lead him to North Texas University where he was in the snare drum line. Stan’s interests were as diverse as his music. He could talk to you about history, politics, soccer, scuba diving, water skiing, sailing, bull riding, horses, home decorating, horse shoeing and cowboy mounted shooting because he had firsthand experience. After college he relocated and sold cars, shaped cowboy hats, bartended, maintained the grounds for Koch and eventually his love for horses led him to become an awesome farrier and certified equine massage therapist. His goal was to help horses and the people who owned them. I can only presume this love developed when he was a little boy, as he would spend a lot of time on his grandparent’s farm. There he rode his grandfather’s horse Cindy whilst running his grandfather’s cattle around the pasture. Stan took parenting seriously which made him a wonderful dad. He was very close to his dad and he wanted to be as good a father as his dad was. He wanted to spend as much time as possible with the kids and with his larger than life personality the kids wanted to spend time with him. 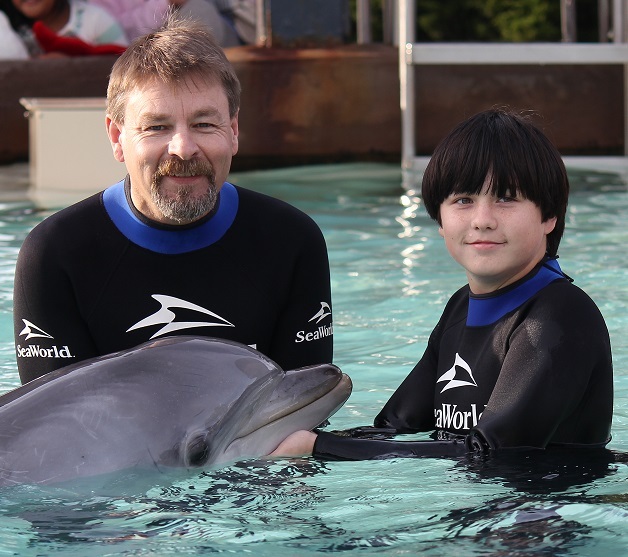 I’m so grateful we took a vacation in which he and Clayton got to swim with the dolphins at Sea World as only a few months later Stan was diagnosed with glioblastoma. I miss him so much…Stan was not only a great husband, he was my best friend. I want to help raise money to fight brain cancer so another family isn’t robbed of a beloved family member.